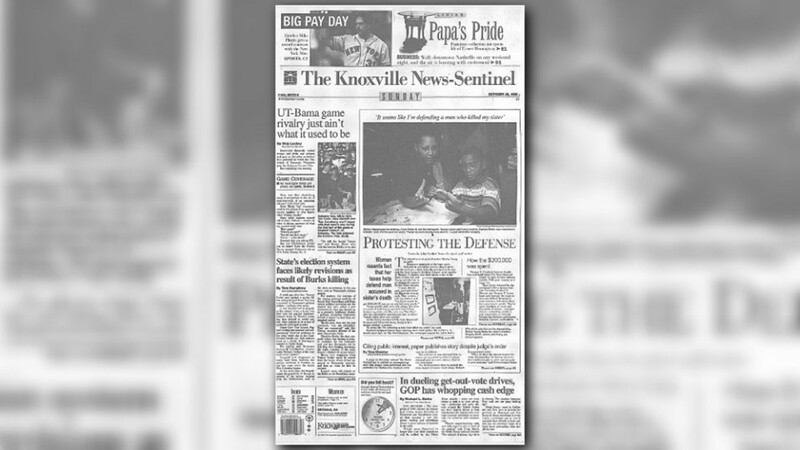 After the Vols kicked off the '98 season with a win at No. 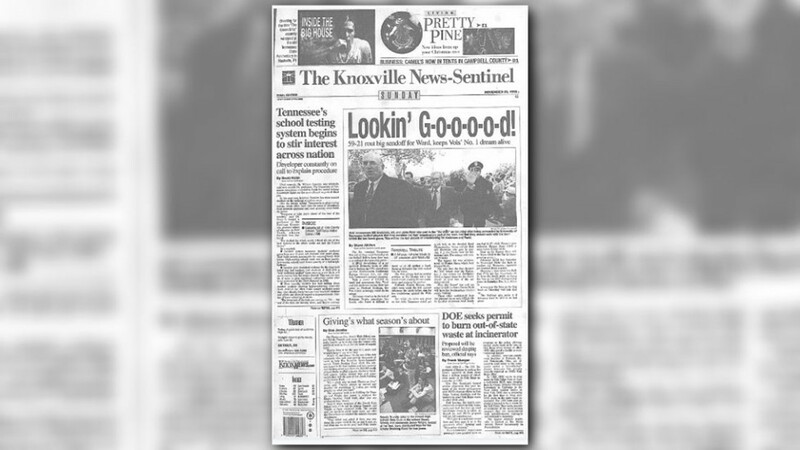 17 Syracuse, the Knoxville News Sentinel headlined the paper with the Vols having "a leg up" on the season so far. 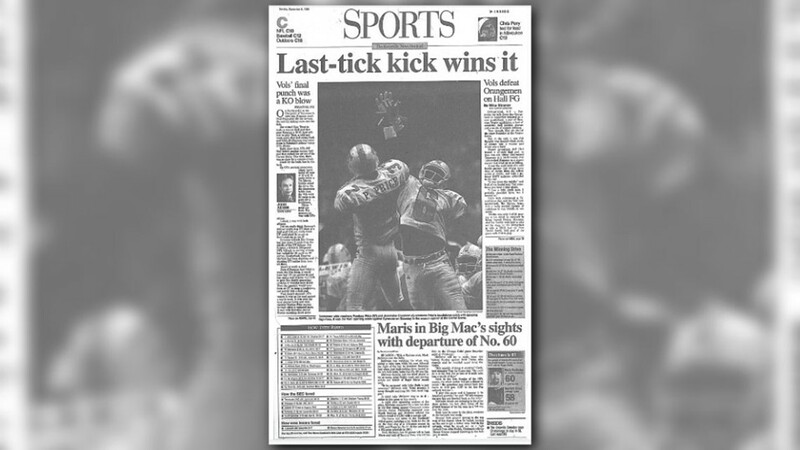 The Sentinel's sports writers called the nailbiter over Syracuse a "last-tick kick." 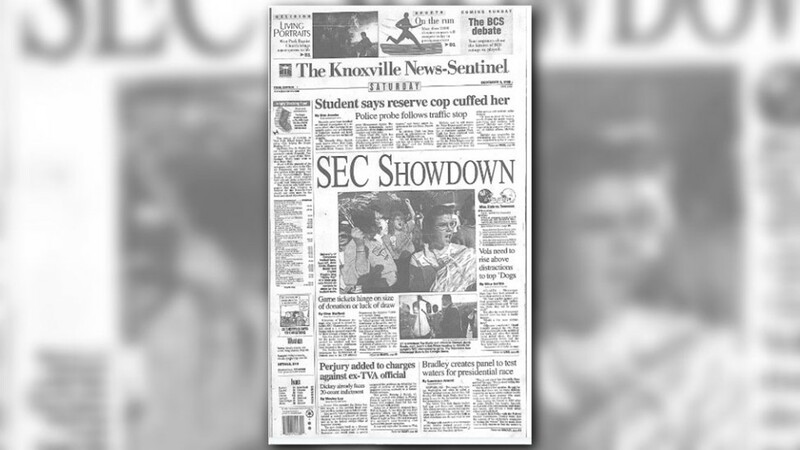 "VOLS DO IT" read the headline at the top of the News Sentinel the day after Tennessee beat Florida 20-17. 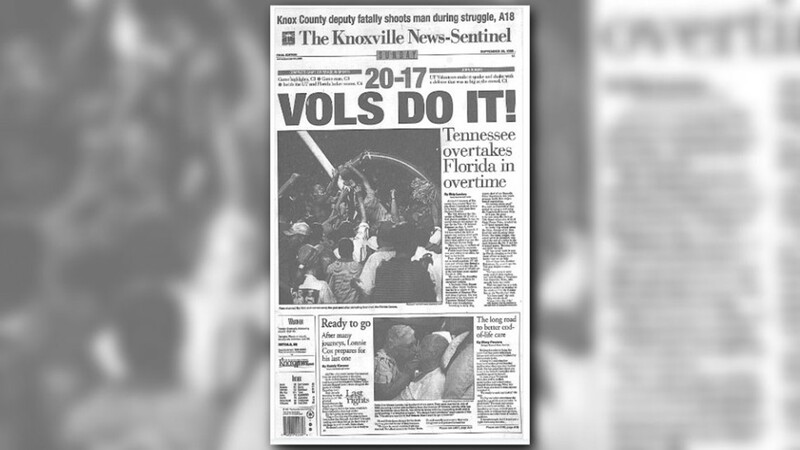 The front page also featured a prominent picture of Tennessee fans tearing down a goalpost. The front page of the News Sentinel's sports section said "Hall-elujah!" celebrating Jeff Hall's 41-yard field goal to beat the Gators 20-17 in overtime. 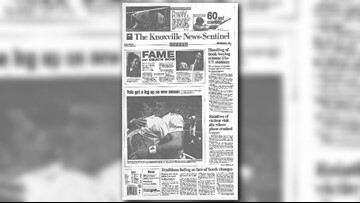 After a 42-7 win over Houston, the front page of the Knoxville News Sentinel focused on injuries sustained during the blowout win. Al Wilson and Jarvis Reado were both injured during the first half. 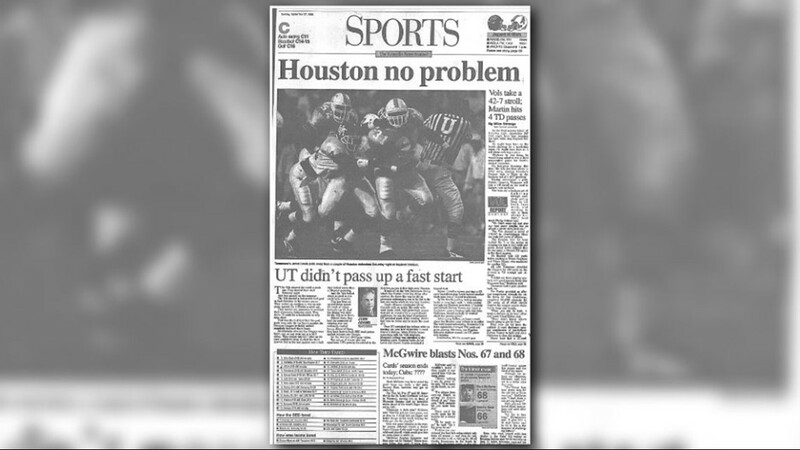 The News Sentinel called Tennessee's 42-7 win over Houston a "stroll." After the Vols' 17-9 win over the Auburn Tigers, the Knoxville News Sentinel showed linebacker Al Wilson cheering his teammates on from the sideline. He injured his shoulder in the previous week's win over Houston. The News Sentinel praised Tennessee's defense after the Vols' 17-9 win over Auburn. 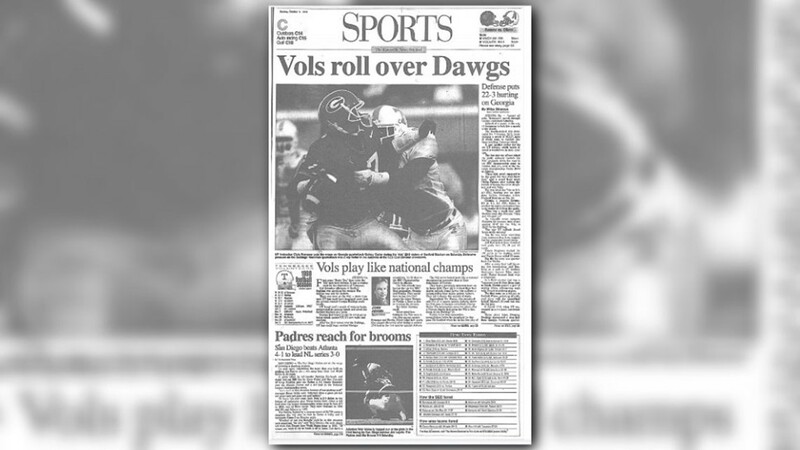 Tennessee solidly beat Georgia 22-3 on October 10, 1998. 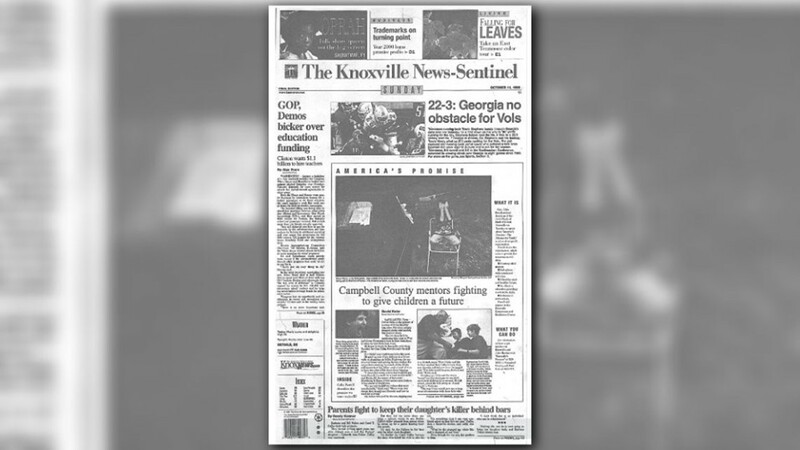 The front page of the Sentinel read: "Georgia no obstacle for Vols." Tennessee's defense got another round of praise from Knoxville sports writers after the Vols crushed Georgia 22-3. John Adams was already calling for a big season for the Vols. His headline read "Vols play like national champs." 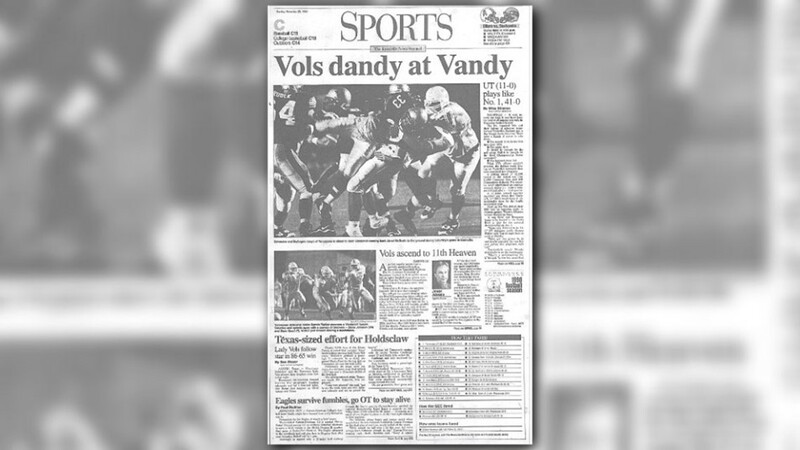 The headline in the News Sentinel after the Vols beat Bama: "UT-Bama rivalry just ain't what it used to be... Has the UT-Alabama rivalry lost its luster? Have the Florida Gators usurped Alabam's role as UT's public enemy No. 1?" 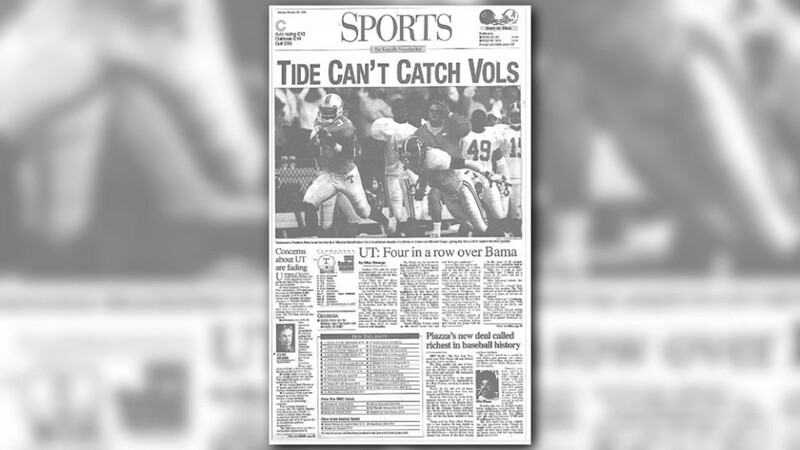 After a 35-18 win over the Tide, the front page of the Knoxville News Sentinel sports page spelled it out in all caps: "TIDE CAN'T CATCH VOLS." 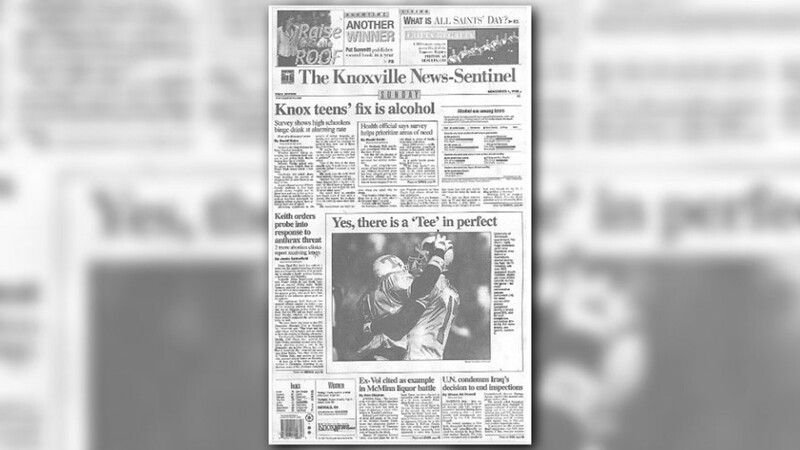 The day after the Vols beat South Carolina 49-14, the Sentinel praised one player in particular for the big win. 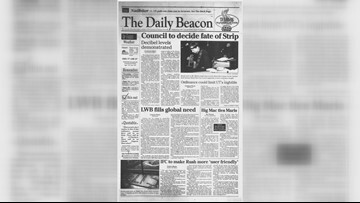 The headline on the front page read "Yes, there is a 'Tee' in perfect." 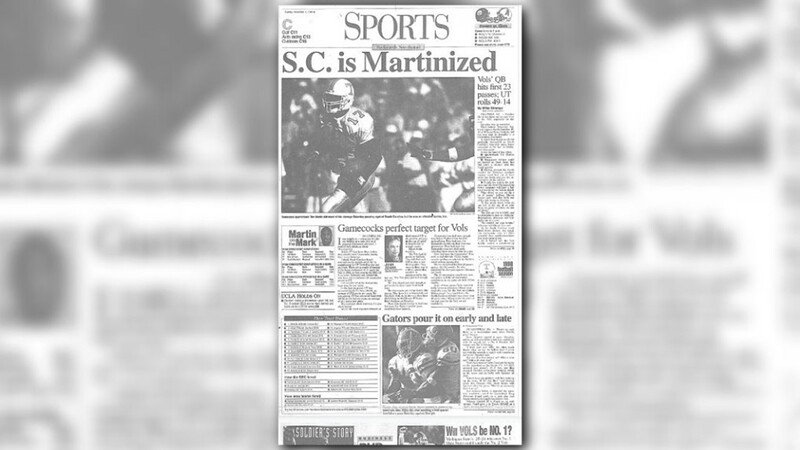 "S.C. is Martinized" read the Sentinel after the Vols trampled South Carolina 49-14. Quarterback Tee Martin completed his first 23 passes against the Gamecocks. 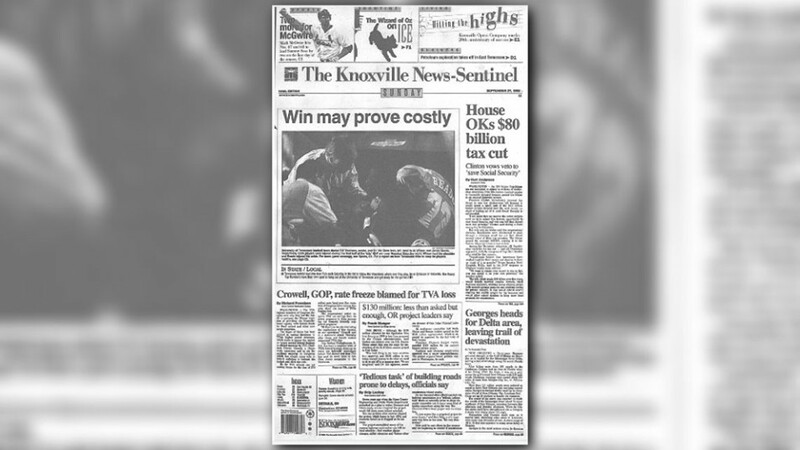 The Vols' 37-13 win over UAB didn't even make the front page of the Knoxville News Sentinel the next day. 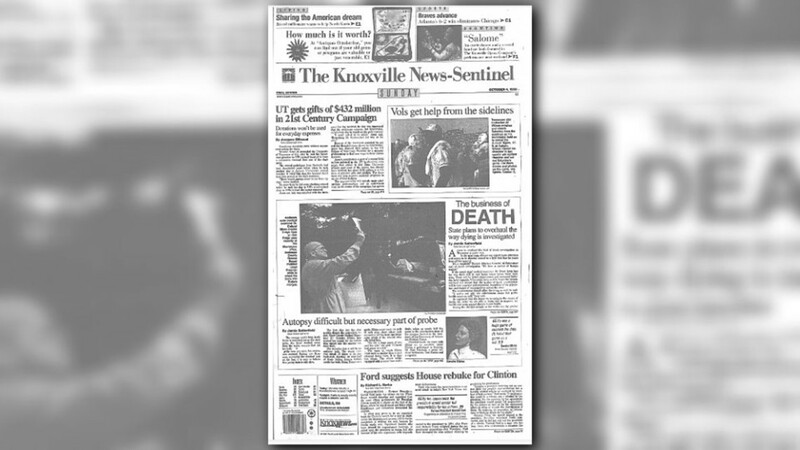 Instead - John Ward's fan send-off took precedent above the fold. 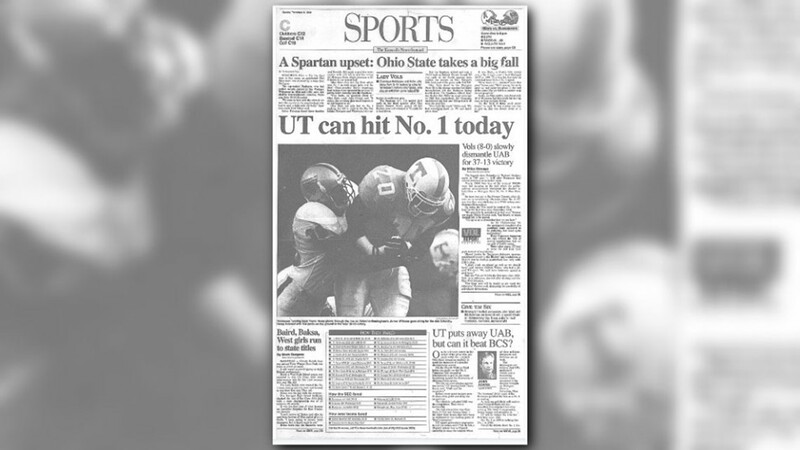 "UT can hit No. 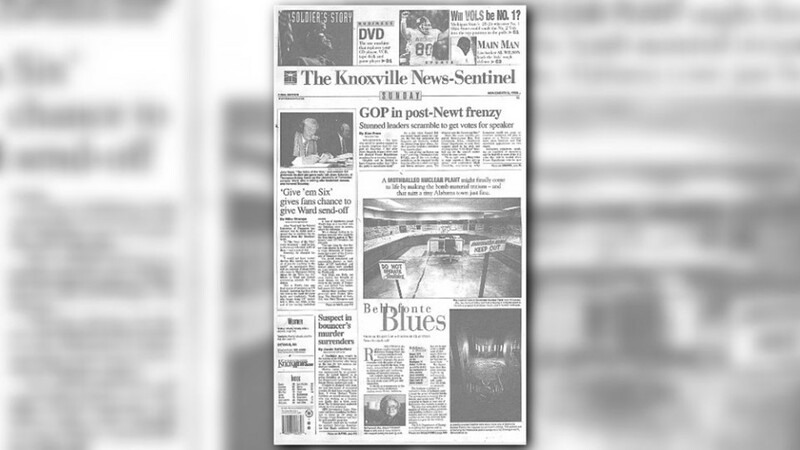 1 today" read the front page of the Knoxville News Sentinel. Tennessee did hit number 1 that week after a 37-13 win over UAB. 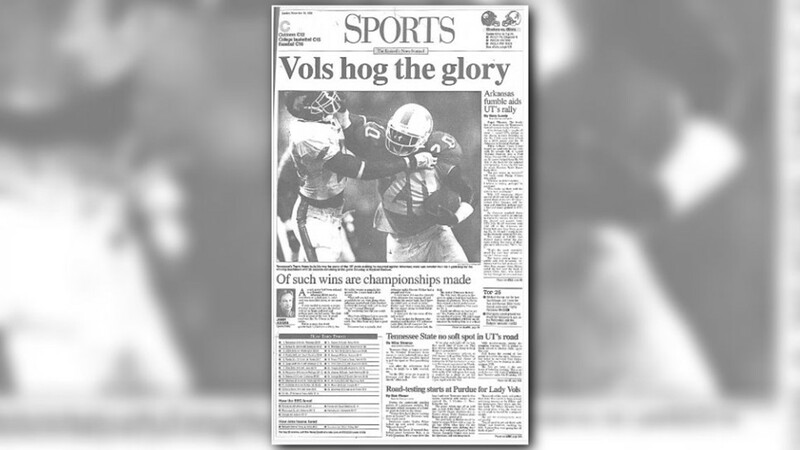 There's only one way to describe Tennessee's last-minute 28-24 win over Arkansas in 1998 - "UnVOLievable!" 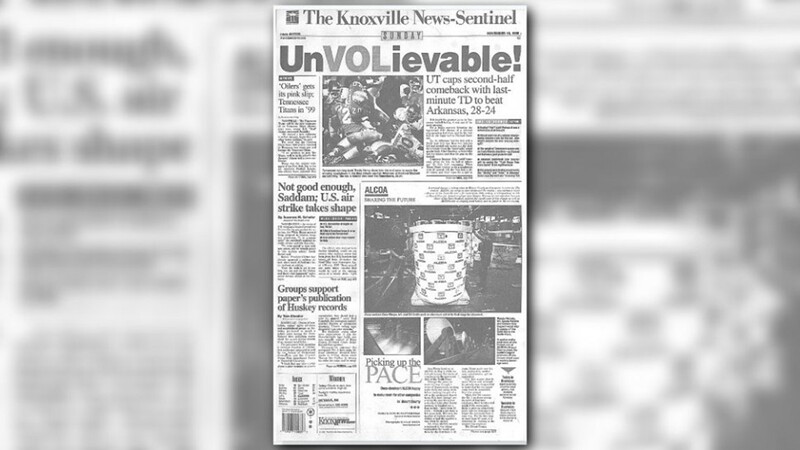 The Knoxville News Sentinel continued its speculation that this Tennessee team was something special. Another John Adams headline said "Of such wins championships are made." Tennessee's 59-21 win over Kentucky was a big sendoff for John Ward. 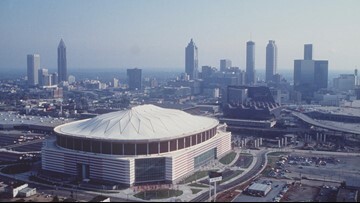 1998 was Ward's last season of broadcasting. 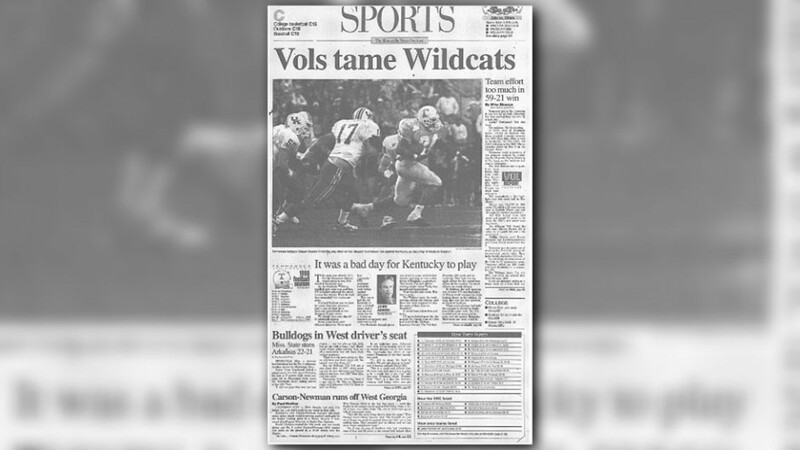 After a 59-21 win over Kentucky, the Knoxville News Sentinel read "Vols tame Wildcats." Tennessee's perfect season continued with a shutout win at Vandy 41-0, putting the team at 11 wins in late November. The News Sentinel sports writers said "UT played like No. 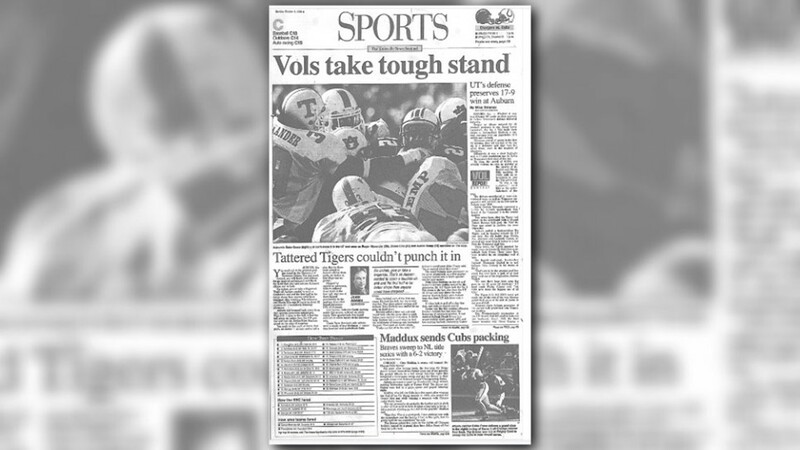 1" against Vanderbilt on Nov. 28, 1998. 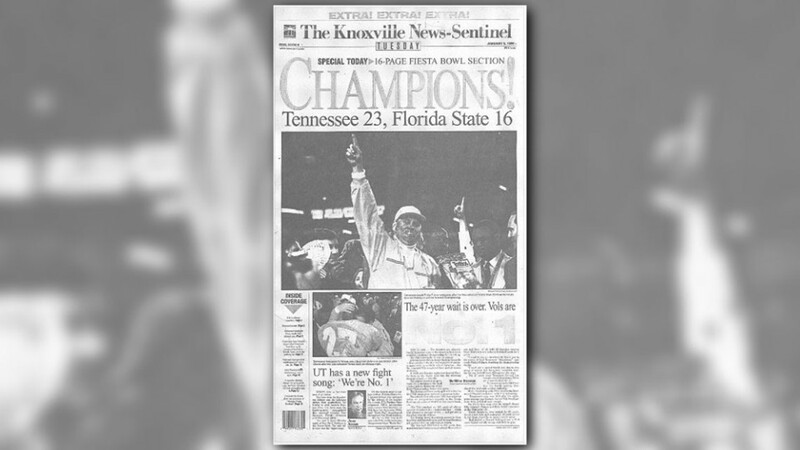 A Dec. 5 win over Mississippi State put the Vols on top of the SEC in 1998. CHAMPIONS. Tennessee beat Florida State 23-16 to win the school's first national title in 47 years.